Kills & repels house flies, stable flies, face flies, horn flies, eye gnats, and ticks on horses. Fights MOSQUITOES that may transmit WEST NILE VIRUS! Water and sweat-resistant formula proven effective even when your horse gets wet. Ideal for pastured horses. Protects up to 14 days! 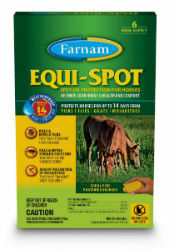 Equi-Spot comes in convenient 10 ml unit dose packages. Simply snap off the end of the tube and apply 5 ml along the back line starting at the top of head behind the ears, along the base of the mane, down the dorsal midline to the base of the tail. Apply 1 ml to the top of the forehead under the forelock. Stripe 1 ml on the front of each fore leg, from the ankle up to the knee and stripe 1 ml to the front of each hind leg, from the ankle up to the hock.